Around 300 AD, a mysterious civilization in Colombia began to sculpt an incredible array of items out of gold. Eventually, these people would become known as the finest goldsmiths of the ancient Americas. Who were the Tairona? The Tairona were a group of chiefdoms who resided in parts of Colombia from 200 AD until 1600-1650 AD. During this period, they “established over 250 masonry settlements across an area of 2,000 square miles.” This includes the famous Ciudad Perdida, or “Lost City.” Ciudad Perdida was unknown to the outside world until it was discovered by treasure hunters in 1972. When artifacts from this site began to appear on the black market, local authorities investigated and found the city in 1975. Unfortunately, information about the Tairona people is scarce, limited to some archaeological sites and a few references written by their Spanish conquerors. However, we do know that “they aggressively repelled the Spanish when they attempted to take women and children as slaves in the first contacts.” This led to great losses among the Spanish and ultimately, “a more diplomatic strategy” for disarming and taking control of the locals. The Tairona people were, in my estimation, the finest gold workers of the pre-Columbian Americas. Their caciques (an example is pictured above) are particularly impressive. These gold cast pendants depict people in richly detailed attire and headdresses. While the subjects are unknown today, they are thought to be chiefs or warriors due to their tough facial expressions and aggressive postures. Chaos, Gold, & the Tairona? One of the opening scenes in Chaos takes place at a recently discovered Tairona archaeological site on an isolated plateau in the middle of the Sierra Nevada de Santa Marta. My hero Cy Reed is there to retrieve a cacique. Unfortunately for him, others in the area will do anything to stop him. At the bottom of the hill, I glanced over my shoulder. Every single worker, male and female alike, raced after me. It was a strange, disconcerting sight, like being chased by an army of angry lemmings. I sprinted uphill and grabbed my climbing equipment. As I slipped into the harness and secured my weapons, I snuck another look behind me. The workers were right on my tail. I didn’t have much time. I didn’t have any time. I stuffed the cacique into my satchel and ran forward to where my climbing rope was still anchored to the boulders below. With a savage cry, I leapt off the cliff. As my feet left the ground, a single thought raced through my mind. The hunt for the cacique plays only a minor role in Chaos. But it’s important nevertheless. First, it connects Cy Reed to the mysterious Beverly Ginger, who has her own plans for the cacique. And second, it marks the first domino in a series of incidents that drives treasure hunter Cy Reed back to the one place on earth he truly fears…New York City. On October 17, 2011, Chaos was officially unleashed upon the world. Readers across the globe thrilled to the heroic exploits of former urban archaeologist turned treasure hunter Cy Reed (well, at least I hope they did!). So, what’s next for the newest hero in adventure/thriller fiction? We’ve come to the end of book club and so I thought I’d give you a few brief thoughts on what’s coming next for Cy Reed. I wrote Chaos to be a modern, urban spin on the traditional adventure story. Rather than scale mountains, Reed scales a skyscraper (well okay, he actually does both). Rather that fighting through a vicious natural river, he’s forced to confront a violent artificial body of water. And rather than fighting a typical “secret society” in order to recover an ancient relic, Reed battles a gang of old subway workers, or sandhogs, who are protecting a decidedly not-so-ancient secret. Even Reed himself is a modern, urban version of the archetypal archaeologist hero. He’s a former urban archaeologist who once worked extensively in New York City. Besides wanting a challenge, I had a good reason for writing Chaos in this manner. In an age of satellite technology, globalization, and the Internet, the world often seems lacking in mystery and adventure. Want to view ancient ruins? Look for photos on the Internet. Want to visit a remote island? Book your flight and accommodations at affordable prices. None of this is a bad thing. We’re fortune to live in a world where questions can be answered and desires to see things can be quenched. And of course, there’s always the vast reaches of the universe. Still, I can’t help but wonder what it was like in an earlier era when so much of the world around us seemed scary and unknown. Thus, I set Chaos in the least mysterious place I could imagine…New York City. And then I set about to create a world of adventure and wonder in that place. I hope I succeeded. But with that story behind me, I want a new challenge, both for myself as well as for Cy Reed. In the not-so-distant future, I’ll be taking an extended expedition to Mexico, Guatemala, and Belize. In other words, the world of the ancient Mayans. I’ll be staying with locals, exploring ancient ruins, and immersing myself in the culture of the Yucatán Peninsula. That will be the setting for the sequel. The novel will also address a theme which I briefly touched on in Chaos…namely, the existence of complex, possibly chaotic systems and mankind’s dangerous attempts to wrangle control over those systems. I may or may not examine the strange ending of Chaos in this next book. But it will be dealt with soon enough. I should mention I’m toying with the idea of writing two other books first, both which fit firmly into the adventure genre. The first is an epic multi-book story about a post-apocalyptic treasure hunt. It has a bit of a science fiction element to it but it’s firmly set in the world as we know it. The second book is a kid’s novel that deals with dark parts of history and science that might hold particular interest for regular visitors to this site…namely, the paranormal. Like the first book, this one will deal with science fiction elements but in a very realistic manner. Incidentally, a few weeks ago, I considering writing a half dozen short stories between Chaos and the sequel. Each short story would be a separate entity in its own right but would serve to connect the events of Chaos with those in the coming sequel. If that’s something you’d find interesting, let me know. The End of Chaos…for Now! Well, there you have it. Our journey has come to an end. But the real journey is just beginning. There are lots of lost treasures, unsolved mysteries, and strange cryptids to discuss. 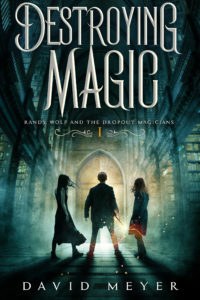 And of course, the sequel…as well as many other books! Thanks for reading along. I hope to see you back here tomorrow! On April 8, 1911, Dutch physicist Heike Kamerlingh Onnes was analyzing the impact of low temperatures on solid metals. While examining pure mercury, he used liquid helium to lower the temperature to 4.2 kelvin. Suddenly, the mercury wire changed into a superconductor…and forever altered the face of science. So what happened to Onnes’ mercury wire? Well, at 4.2 kelvin, its electrical resistance vanished. And thus, the strange science of superconductors was born. A superconductor is a substance that shows zero electrical resistance at very low temperatures. This occurs because the low temperature causes atoms to cease random vibrations. Thus, electrons can flow freely from one atom to another with no resistance. This allows an electrical current to flow continuously through the superconductor with no power source. In 1933, Walter Meissner and Robert Ochsenfeld discovered that superconductors also exhibit something that has come to be known as the Meissner Effect. When the right substance is cryogenically cooled, it expels its internal magnetic field. This allows it to perfectly repel a magnetic field aimed in its direction. This turns the superconductor into “a mirror image of the magnet.” In practice, the Meissner Effect allows a superconductor to float endlessly above a powerful magnet. Suffice it to say that superconductors remain a source of great interest and mystery for physicists. They are expected to provide future opportunities in electric power transmission, transformers, power storage, and even magnetic levitation devices. Superconductors are a fascinating field of research. As those of you who’ve read the novel know by now, they also inspired me in my creation of die Glocke, or the Nazi Bell. Hmmm…I wasn’t going to give this away but…well…okay. If you haven’t read Chaos yet, don’t read this next part! I don’t want to spoil it for you. I knew Beverly was behind me, but I could no longer feel her presence. The blanket dominated my attention. While unremarkable on its own, it carried heavy symbolism for me. It was the last remaining barrier between the Bell and me. I walked over to it. As I grasped its coarse edge, I wondered what secrets I’d find on the other side. Would the Bell look the same as I’d imagined it? Could we destroy it? I pulled the blanket out of the way. My beam lifted, casting into the space. The flashlight fell from my fingertips. It bounced on the floor and rolled. I felt a sudden reverence as if I stood before the Almighty Himself. You can probably guess what keeps the mysterious Bell floating in mid-air. But Cy Reed’s journey is just beginning. He has to figure out a way to destroy the Bell. The fate of the world depends on it. You can read more about his thrilling adventure by getting a copy of Chaos at one of the links above. That’s it for today. Tomorrow is the last day of the Chaos book club. For those of you who’ve stuck with me for this long, I’ve got a little treat for you. We’re going to take a look down the road at the coming sequel to Chaos. Stop by tomorrow to check it out…you won’t regret it! On April 9, 1873, Governor John Adams Dix signed the Beach Pneumatic Transit bill into law. After more than three years of legislative battles, Alfred Ely Beach was finally poised to begin work on New York’s City first real subway system. But the proposed system was never built. What happened? Yesterday, we briefly examined the story of Alfred Ely Beach. Simply put, he was a brilliant inventor who recognized the need for a subway system in New York City. But he knew that Boss Tweed, the corrupt leader of Tammany Hall, would never let him build it. So he secretly constructed a demonstration tunnel under the streets of Manhattan, hoping that public opinion would force Tweed’s hand. The tunnel was a hit and Tweed saw an opportunity. He joined forces with Beach and together, the two men lobbied the legislature for permission to expand the system. However, the proposal stalled, partly due to concerns from the Astors and other wealthy families that subway tunnels would undermine their properties. Still, with Tweed at his side, Beach was in pretty good shape…that is, until the Orange Riot of 1871. That year, Tweed allowed Irish Protestants to parade in the city, celebrating the 1690 Battle of the Boyne. But for the second straight year, the parade erupted into violence between Irish Protestants and Irish Catholics. Some sixty civilians and three members of the New York State National Guard died in the riot. Tweed’s inability to control the people led others to question his leadership. An anti-Tweed campaign initiated by the New York Times and the political cartoonist Thomas Nast gained steam. The Times proceeded to publish a series of articles exposing massive corruption in Tammany Hall (the Democratic Party political machine in New York City). This culminated in Tweed’s arrest in 1871. Tweed was released on bail and was even re-elected to the state senate a little while later. But the damage was done. Tammany Hall began to crumble and Tweed was rearrested. Beach was forced to separate himself from the tarnished politician. He accomplished this with such vigor that he created a pseudo-mythology that continues to this day. In this revised version of history, Tweed and Beach had never joined forces. Instead, Tweed had fought Beach’s every effort to build the subway system. Thanks in part to this campaign, Beach finally gained political approval in 1873. But that was by no means a sure thing. Unfortunately, a financial crisis was about to erupt, one that shared some general similarities to the current crisis. Following the Civil War, the U.S. government granted land and subsidies to railroad companies, creating the framework for massive expansion. Investors responded to the false signals by pouring cash into the industry. Of course, the boom was unsustainable. The Panic of 1873 led numerous banks to fail and many factories to close. It also dried up Beach’s funding sources. The End of the Pneumatic Subway System? Eventually, Beach gave up and closed his demonstration tunnel. He died in 1896, having never seen his dream of underground transit come to light. It would be another eight years before the first underground line of the New York Subway system opened to the public. Unfortunately, Beach’s demonstration tunnel was destroyed back in 1912. There’s a very slim chance that some remnants of the waiting room might still exist. However, this is highly unlikely. 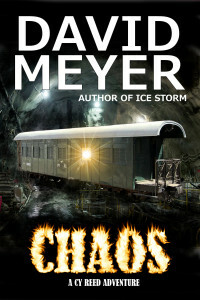 When I sat down to write Chaos, a question popped into my mind: What if Alfred Ely Beach started to build his own full-scale subway system under New York prior to the crash? It’s clear he was the type of man who’d do whatever it took to achieve his goals. And it’s not like he didn’t have the capabilities…after all, he built his demonstration tunnel in relative secrecy and with his own funds. Working on that assumption, I dug up maps for Beach’s planned route, one of which you can see here (figure 10-22). Then I went to work, constructing the remnants of a “lost subway system” buried deep under New York. I clambered off the rock pile, ignoring my protesting muscles. I was tempted to call for a brief rest but all that changed when my beam fell upon the wall at the end of the tunnel. It twinkled brightly, casting additional beams in hundreds of different directions. As my eyes grew accustomed to the light, I realized that the wall wasn’t the end of the tunnel. It was part of an entirely separate tunnel. A perpendicular tube connected to the one in which we stood, forming a T-intersection. Keeping an eye out for explosives, I strode forward and stopped at the point where the two tunnels intersected each other. I shone my light about the new tube in both directions, marveling at the spectacle before me. It wasn’t gigantic, maybe two feet taller and five feet wider than the current one. But it was unlike any tunnel I’d ever seen. There were no signs of crumbling concrete or ugly metallic beams. In fact, the entire passageway looked like it belonged in an art museum. It was almost perfectly cylindrical except for a deep, smooth groove carved out of the red-bricked floor. Arching beams, painted bright red, sprouted out of the ground and ran across the ceiling before returning to the ground again. Brightly colored, ornate tiling covered the walls. My remaining doubts melted away. Still, I could scarcely believe that I was looking at an abandoned subway tunnel constructed decades before the rest of the system. But it wasn’t just any tunnel. Cy Reed’s triumph is all too brief. And even though he’s found Beach’s lost system, that’s of little consequence…what really matters is what’s hidden inside the maze of underground tunnels. You can read more about his thrilling adventure by getting a copy of Chaos at one of the above links. That’s all for now. Tomorrow, we’re going to venture into the world of science to examine the strange world of superconductors. Stop by tomorrow to check it out…you won’t want to miss it! On August 6, 1945, the United States of America dropped an atomic bomb on Hiroshima, Japan. Three days later, it dropped a second bomb on Nagasaki. These bombs remain the only two nuclear devices ever deployed during war and, according to many experts, decisive reasons for Japans’ subsequent surrender on August 15. But a substantial amount of experts think the Hiroshima atomic bomb and the Nagasaki atomic bomb were unnecessary and worse, were dropped for political purposes. So, who’s right? As I mentioned above, the official story of the Hiroshima atomic bomb is that it caused Japan to surrender and thus, ended World War II. This saved hundreds of thousands of American lives since soldiers were spared from having to conduct Operation Downfall, or the planned invasion of Japan. But here’s the problem with that scenario. Prior to the Hiroshima atomic bomb, President Harry Truman was aware of the fact that Japan was willing to surrender as long as Emperor Hirohito was allowed to keep his position and was not forced to stand trial for war crimes. Hirohito’s stated purpose was that he wanted to maintain discipline and order in Japan after the war was over. President Truman insisted on an unconditional surrender however, and went ahead with the bombings. But after Japan surrendered, Hirohito was allowed to keep his throne and escape prosecution. This strange sequence of events begs the question…what purpose did the Hiroshima atomic bomb serve? And this wasn’t just post-war regrets either. In his book, The Decision to Use the Bomb, Gar Alperovitz shows that practically every single American civilian and military advisor suggested that Truman accept Japan’s terms. But Truman chose to listen to the lone dissident, James Byrnes, instead. So, what was Byrnes up to? Clues can be found in discussions surrounding the 1945 Potsdam Conference. The Hiroshima Atomic Bomb Myth & Damage Control? So, there’s a case to be made that the Hiroshima atomic bomb was deployed to scare Russia rather than to defeat Japan. But if this is true, then why is the general public largely unaware of this today? According to Alperovitz, the “Hiroshima myth” started shortly after Japan’s surrender. Admiral Halsey, Commander of the Third Fleet, called the bombs “a mistake.” Albert Einstein took to The New York Times to tell people that “a great majority of scientists were opposed to the sudden deployment of the atom bomb.” Other military leaders started to come forward, expressing their misgivings over the decision. James Conant, Chairman of the National Defense Research Committee, decided that it was important to convince the American public that the atomic bombs were necessary. He approached Secretary of War Henry Stimson, who wrote a long article on the subject for Harper’s magazine. This became the basis for the story that is widely-accepted today. Truman would later uphold this point of view, adding that his decision saved half a million lives. The Hiroshima Atomic Bomb…the first shot of the Cold War? World War II is often called “The Last Good War.” Unfortunately, at least in this case, the facts point to a different conclusion. The atomic bombs killed 90,000-166,000 people in Hiroshima and 60,000-80,000 in Nagasaki. Many of these people were women and children. Worse, there is reason to believe that the bombs were deployed to scare the USSR rather than for military purposes. If true, then the atomic bombs weren’t just the last shots of World War II…they were the first shots of the Cold War. By the way, my purpose here isn’t to find fault with America. Indeed, too often citizens conflate the idea of “America the government” with “America the country.” It’s quite possible to find fault with one and not the other. In this case, I’m questioning the choice of President Harry Truman and the motives of James Byrnes. Chase grabbed both side of his silk shirt and yanked. It burst open, revealing a disgusting mass of scars, welts, and discoloration. By the way, Chase’s past is based on fact. According to Barton Bernstein’s, Unraveling a Mystery: American POWs Killed at Hiroshima, at least 11 and possibly as many as 23 American POWs died in the Hiroshima blast. It’s a sad and often forgotten footnote to that awe-inspiring disaster. Later, we see the full extent of Jack Chase’s fury as he races to unleash his sinister plan…a plan that promises to rewrite the world as we know it. If you want to know what happens, pick up a copy of Chaos at one of the links above. That’s all for today. Tomorrow, we’re going further back in time, specifically to Manhattan circa 1869. Stop by tomorrow to explore one of New York City’s greatest secrets…I hope to see you then! In 1964, Lawrence Livermore National Laboratory conducted a top-secret experiment with enormous global ramifications. The project remained classified until 2003 when heavily-excised documents were finally released to the public. What was the Nth Country Experiment? In May 1964, the Livermore Radiation Laboratory offered a special assignment to a man named Bob Selden. It was the culmination of a strange couple of days that began when Selden – who held a PhD in physics – was interviewed by Edward Teller, the “Father of the Hydrogen Bomb.” Teller grilled him on the physics of making nuclear weapons, a topic of which Selden knew little. The assignment? Selden was tasked with developing a working nuclear weapon design using nothing more than publicly-available information. At that time, only four countries knew how to develop nuclear weapons. The U.S. was the 1st country to achieve this feat, the USSR was the 2nd, the UK was the 3rd, and France was the 4th. That begged the question: How difficult would it be for the “Nth country” to follow suit? Could the “Nth Country” develop Nuclear Weapons? For two weeks, the two men heard nothing about the success of the Nth Country Experiment. Instead, they were sent to defense and scientific agencies to give lectures on their results. But eventually, they learned that they’d succeeded in creating a credible design for an atomic bomb. The Nth Country Experiment’s Influence on Chaos? The Nth Country project officially ended on April 10, 1967. Prior to the Nth Country Experiment, “there were two schools of thought [in regard to nuclear weapons] – that the ideas could be kept secret, and that the material could be locked up.” But Dobson and Selden proved that the ideas were easily accessible to any country that employed reasonably intelligent physicists. Thus, nuclear proliferation efforts became focused on keeping the materials, namely uranium and plutonium, under tight wraps. His eyes tensed. Then, his hand reached to his collar and scratched his neck. I caught a glimpse of a large ugly welt underneath his shirt’s fine fabric. Moments afterward, all hell breaks loose as Cy launches a daring counterattack. If you want to know what happens next, treat yourself to a copy of Chaos today. That’s all for now. Tomorrow, we’re going to examine one of the most explosive controversies in history. Were the atomic bombs dropped on Japan really necessary? Or was their an ulterior motive behind their deployment? Stop by tomorrow to weigh in on the debate…I hope to see you then! In 1937, Otto Hahn and Fritz Strassman split the atom, giving Nazi Germany an early edge in the race to build the world’s first atomic bomb. Just how close did Hitler get to developing the most powerful weapon mankind has ever known? At first, the Nazis weren’t fully aware of the military potential of Hahn’s and Strassman’s work. But that changed after they conquered Poland in 1939. Almost immediately, German military leaders banned the export of uranium and attempted to increase the importation of it via the Belgian Congo. After conquering Norway in June 1940, the Nazis got their hands on the Hydro-Electric Company’s Vemork-based electrolysis plant. Suddenly, Europe’s only source of heavy water, a key ingredient for an atomic bomb, was in their hands. By early 1942, Nazi scientists had built their first atomic reactor. However, when Hitler realized that the atomic bomb would not be ready in the near-term, he switched resources away from the Uranverein, or Uranium Club. The project lost numerous scientists to more pressing military concerns. Although research had slowed, it hadn’t stopped. But a series of sabotage attacks on the Vermok plant by the Norwegian resistance movement hampered heavy water production. The plant was finally bombed into submission in February 1944. Nazi leaders ordered the remaining supplies to be delivered to Germany. 613 kilograms of heavy water and 14 tons of fluid were subsequently loaded onto the ferry Hydro and the vessel sat out across Lake Tinnsjo. But unbeknownst to the Nazis, a Norwegian commando named Knut Haukelid had planted explosives on the boat. 45 minutes after leaving shore, the Hydro exploded, causing a tremendous echo that was heard for miles and killing a number of innocent Norwegians in the process. The boat sank into the 1,300 foot deep lake, putting a dramatic end to the Nazi effort to build an atomic bomb. Nearly all scholars agree that the Nazis never got close to building an atomic bomb. Even the cache of heavy water aboard the Hydro was far short of the amount needed to fuel an atomic reactor. Thus, it’s no surprise that author Rainer Karlsch turned some heads when he published Hitlers Bombe, in which he claimed that Hitler built and tested a non-standard nuclear weapon, possibly a “dirty bomb,” near the German town of Ohrdruf. However, the soil revealed relatively normal radiation levels and historians have generally dismissed the claim. I exhaled loudly. A single brush against the flint would send tiny sparks hurtling toward the journal, igniting it instantly. Tiny, golden flames would lick the air, adding light to the dim station. It would take just a moment. And then, I could forget all about Hartek’s journal. Although he doesn’t know it yet, Cy’s decision will have gigantic ramifications. If you want to see how, please consider picking up a copy of Chaos at one of the links above. That’s it for today. Tomorrow, we’re going to take another curious trip through history, one that will bring us to a strange, top-secret 1964 operation called the Nth Country Project. The results of that project were…to say the least…startling. Stop by tomorrow to find out what I mean…I hope to see you then! There are currently 118 confirmed chemical elements, the last 24 of which are synthetic. But as scientists construct larger and larger atomic nuclei, these artificial elements become increasingly unstable, often breaking up in mere seconds or even microseconds. However, some scientists believe that this won’t always be the case and await the day when the “Island of Stability” is finally discovered. What is this mysterious Island? Stretching the Limits of Science? The search for elements is an exploration in its own right, with its own goals, setbacks, and personalities. The last naturally-occurring element was discovered (well, rediscovered) in 1925. And for a short while, many scientists thought that the “Age of Element Exploration” was over. But all that changed when the first artificial element, dubbed technetium, was created in 1937 (technetium has since been shown to exist in very minute quantities on earth). Scientists began to create new and larger elements. In 1940, Glenn T. Seaborg bombarded uranium with deuterons and synthesized the gigantic 94-proton nucleus of plutonium. They didn’t stop there. Seaborg and others continued to build bigger and bigger elements. However, these elements were increasingly unstable and broke up quickly. Many scientists thought they were nearing the end of the Periodic Table. In the late 1960s, Seaborg proposed the “Island of Stability,” a hypothetical concept that would allow the Periodic Table to stretch even further. He suggested that an atomic nucleus was made of up electron “shells” and that the stability of an element depended partly on whether its shells were filled. Some possible configurations were elements that contained 184 neutrons and 114, 120, or 126 protons. These “superheavy” elements could, theoretically, have extremely long half-lives. With renewed vigor, scientists began to discuss the quest to reach the Island of Stability. The journey would take them past the stable “mountains” (smaller elements) and through the “Sea of Instability” where elements underwent near spontaneous fission. In 1998, scholars neared the Island’s shores when they created Element 114. However, the isotope that they synthesized didn’t contain the optimal amount of neutrons. And that is where we stand today. The quest continues and someday soon, we will hopefully discover the mysterious Island. The idea of a stable, superheavy element residing on the Island of Stability is intriguing. It seems possible that such an element would have unusual properties. Obviously, it would exhibit an extended lifespan, perhaps one lasting days, months, or even years. And since it would be super-dense, it’s possible that it would be nearly indestructible as a result. Jumping up, I knocked his gun hand into the air. As I did so, I released the powder and it flew toward the river. Chase and I struggled over the gun. I knocked it from his grasp. It fell to the ground and he shoved me toward the river. As he stooped for his gun, I saw my pistol. My fingers closed around it. There was no time to think, only time to react. Raising the gun, I pointed it into the air. But before I could fire, the drifting cloud of Red Mercury sparked. I wish I could say things get better from there. Unfortunately for Cy Reed, things get worse…much, much worse. If you want to see how, treat yourself to a copy of Chaos today. That’s all for now. Tomorrow, we’re going to take a trip back to Nazi Germany to uncover one of its most frightening wartime projects, one that caused tremendous fear and consternation for the Allies. If you want to know what I mean, stop by tomorrow to find out…I hope to see you then! Around 1977, a strange, exotic material known as Red Mercury appeared on the international black market. Shrouded in mystery and highly desired by buyers, it caused an uproar across the globe. Just what was Red Mercury? Red Mercury burst into national prominence in the early 1990s thanks to a series of high-profile newspaper articles. No one knew what it was, other than it was really important and really dangerous. Oh, and very expensive…prices ranged from $100,000 to $300,000 per kilogram. The legend of Red Mercury soon took on a life of its own. Con artists went to work to fill the insatiable demand, grabbing gigantic wads of cash and giving away useless chemical mixtures in return. Researchers attempted to sort through the mess and eventually determined that Red Mercury was nothing more than a hoax. However, that conclusion remains questionable. Why would individuals, groups, and nations drop hundreds of thousands of dollars on useless chemicals? Didn’t they bother to ask for proof that it worked before they gave away their cash? When Red Mercury first hit the market, it was sold as a material that could be used to build atomic weapons. Since then, various theories have been put forth to explain its purpose. It has been considered a code name for uranium or plutonium as well as a form of stealth paint. However, the most interesting theory is that Red Mercury represents a shortcut to fissile material. Hydrogen bombs consist of two stages. In the first stage, a “primary” fission bomb explodes. This compresses a “secondary” section of fusion fuel, causing a fusion reaction. The resulting explosion is, needless to say, massive. All atomic weapons require the use of some sort of fissile material (U-233, U-235, Pu-239, or Pu-241). Fortunately, these raw materials are difficult to locate. And even if a nation were to get hold of enough uranium, it would still face the challenge of enriching it to weapons-grade level. This requires expensive centrifuges that take years to operate. Thus, nuclear non-proliferation efforts mostly focus on limiting access to the raw materials and centrifuges. Some believe that Red Mercury facilitated the creation of fissile material, allowing a nation to proceed much faster than under ordinary circumstances. Others, such as Samuel T. Cohen (pictured above) claimed it was a ballotechnic. A ballotechnic is a hypothetical chemical, capable of releasing enough energy during a reaction that it could serve as a direct replacement to fissile material. Cohen, who was the “Father of the Neutron Bomb,” alleged that the U.S. government was deliberately hiding the true purpose of Red Mercury from the public. If either of the above theories were true, the consequences would be disastrous. Nuclear non-proliferation efforts, at least in their present form, would become useless. The idea of a world where thermonuclear weapons technology is readily available to anyone who wants it is not a pleasant one. In Chaos, (SPOILER ALERT), this possibility is at risk of becoming a reality. Red Mercury weaves tightly into the story. The hero, Cy Reed, has his work cut out from him if he’s going to avoid a nuclear proliferation nightmare. But as with much of Chaos, nothing is as it seems and there is more to Red Mercury than meets the eye…much more. If you want to know the deepest secrets of this exotic material as well as Cy’s desperate fight to rid the world of it, consider picking up a copy of Chaos today. That’s all for now. Tomorrow, we’re going to delve a little further into the myths surrounding Red Mercury. Specifically, we’re going to take a look at a strange type of element and an “island” no one has ever stepped foot upon. What am I talking about? Stop by tomorrow to find out…I hope to see you there!